Who Is the Ideal Candidate for Chicago Back Liposuction? Though it may not be as popular as abdominal liposuction, back liposuction can accomplish great things! The back is one of the easiest areas of the body to conquer using Waterlipo™ and our patients at the Chicago Liposuction by Lift Body Center often see dramatic results from their surgery as a result of back & bra liposuction. Back liposuction can be used to correct common issues such as bulges around the bra and back rolls but it can also be used to remove excess deposits of fat anywhere on the back. After the surgery, patients report that their clothes fit better, their skin feels tighter, and they look slimmer overall. Back liposuction can produce truly amazing results! Our doctors use an innovative, integrative approach to target back fat using liposuction. First of all, we use Water Lipo, a new technology in liposuction surgery, to gently wash away excess fat cells rather than scraping them off the surrounding tissues using traditional liposuction techniques. By using pressurized water to gently and safely remove fat cells, patients see smoother results and require less downtime for recovery. A secondary benefit of using Waterlipo™ to target excess back fat, is that our doctors are able to avoid using general anesthesia and instead use a system of anesthetization known as AwakeLipo on patients. The gentleness of Waterlipo™ combined with it’s excellent safety profile, makes it possible to avoid the potential risks and complications of general anesthesia. Instead, surgeons administer only a local anesthetic and a sedative so that the target areas of the body are thoroughly anesthetized and the patient feels extremely relaxed and comfortable throughout the procedure, but they can be awakened during the surgery, as needed for repositioning. Many patients can benefit from back liposuction. In fact, our patients regularly tell us that the final results they’ve gotten from targeting the back has made a huge difference in their appearance and sense of self-confidence. By removing fat rolls or bra bulges on the back, it’s possible to achieve dramatic results that are still very natural-looking. Good candidates for this procedure have back fat that would respond well to body sculpting using Water Lipo. The ideal candidate for back liposuction using Waterlipo™ has tried unsuccessfully to use diet and exercise to get rid of excess fat in this area of the body. These patients make ideal candidates because they may be genetically predispositioned to have localized pockets of fat on their back, which has made it nearly impossible for them to get rid of it once it settles there. The best candidates for this surgical procedure are self-conscious about their back fat. Our doctors at the Chicago Liposuction by Lift Body Center use Waterlipo™ to remove excess fat deposits to yield a more proportional appearance in terms of the rest of the body. Patients must be close to their ideal body weight (no more than 30% above or below). The patient’s weight should be stable. They should be healthy with no major, life-threatening illnesses. The patient’s skin should have good elasticity. The patient should have good muscle tone. We find that when patients have realistic expectations about this procedure, they tend to be satisfied with the end results. Our doctors at the Chicago Liposuction by Lift Body Center will discuss back liposuction during an initial consultation to determine whether it’s the right option for you. We’ll discuss the possibilities during this first appointment to help you develop realistic expectations about what can be accomplished using Waterlipo™ to treat the back. It’s important that patients realize that back liposuction is not a weight loss procedure. Patients should be close to their ideal weight before this procedure is performed. While some of our patients do, in fact, use liposuction as a motivating way to jumpstart a new, healthier lifestyle, it’s important that patients already be in good health before surgery to ensure a speedy recovery. Needless to say, smoking, drugs, and alcohol can slow or impede the healing process after surgery, so the ideal candidate for this procedure would be a non-smoker, who drinks only in moderation. Patients are asked to avoid alcohol for at least a week prior to surgery and throughout recovery. Drugs should be avoided altogether. 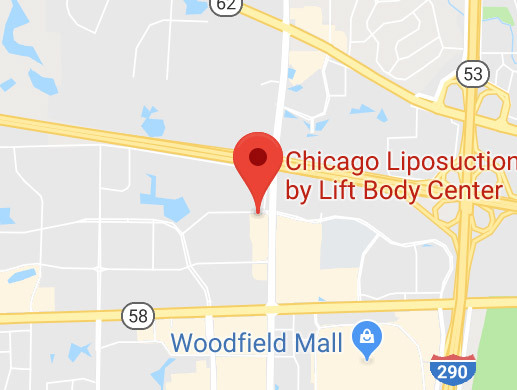 Our mission at the Chicago Liposuction by Lift Body Center is to provide patients with the best results, the safest techniques, and the least amount of downtime. Most patients see changes in their appearance immediately after Waterlipo™ surgery, but during the initial stages of recovery, the body may swell and look different. Typically, most of the inflammation goes away after the first 2 to 3 weeks of recovery, but the final results from the procedure may not become visible for up to 6 months. The recovery time required for back liposuction varies from patient to patient but the vast majority of our patients are fully recovered and back to their normal routine within 4 to 6 weeks after the surgery. The recovery time will depend somewhat on the patient’s pre-operative health profile but recovery is also affected by how much rest the patient gets and how well the patient cares for themselves overall during recovery. Following the doctor’s instructions and getting plenty of rest often speeds the recovery process considerably. After back liposuction using Water Lipo, we encourage patients to take at least 48 hours to recuperate and rest. Many patients report feeling tenderness or pain in the treated area. Your doctor will prescribe pain medications to make you feel more comfortable during these initial two days. Within about 1 week, most patients report that their pain has subsided. Usually, at this time, the stitches can be removed. Within 2 weeks after the surgery, most patients are able to get back to their normal, daily activities. Wear Your Compression Garment -For the initial period following your surgery, your doctor will ask that you wear a compression garment 24 hours a day. This garment will provide support to your skin as it meshes with the underlying tissues, ensuring that the final result will look natural. Be sure to wear the garment for the prescribed period of time and only remove it to take showers. Then, put it back on. Follow a Healthy Diet -Following a healthy diet means feeding your body plenty of nutrients so that it can have all the necessary tools to heal properly. A healthy diet can have a big impact on the final results from Waterlipo™ surgery. Eat plenty of fresh fruits and vegetables and whole grains to get the best results from your procedure. Drink Plenty of Water -Every chemical reaction in your body takes place in water. During the healing process, all kinds of important chemical reactions are taking place. When you drink plenty of water and stay hydrated, your body can heal more quickly. Take Prescribed Medication -The doctor may prescribe certain medications to be taken before or after surgery. Take these meds on schedule, according to the prescription. Avoid Strenuous Exercise -During the recovery period, it’s important to avoid over-exertion. Your body needs time and extra energy to heal properly. By allowing your body to rest and avoiding strenuous exercise, your body can put extra energy into healing. In order to get the best results from back liposuction surgery, our surgeons at the Chicago Liposuction Speciality Clinic will customize the treatment protocol to fit each patient’s unique needs. During the initial consultation, the doctor and patient will discuss the goals for the procedure along with the patient’s health history, and any other important information relevant to the procedure. Each patient’s treatment plan reflects their individual situation. Before and After photos are taken to illustrate the dramatic results that are possible using Waterlipo™ to treat the back, but patients should expect to see results that are uniquely their own; a more refined, aesthetically pleasing, and proportioned back that complements the rest of their features. Back liposuction is generally considered to be an elective surgery, so unless you are having liposuction for reconstructive purposes, it will not usually covered by health insurance. You can review your health insurance policy to find out whether your particular Waterlipo™ procedure would be covered or you can contact the staff at the Chicago Liposuction Speciality Clinic to find out whether your procedure would be covered by insurance. At the Chicago Liposuction by Lift Body Center, we offer several different lending options to make our procedures more affordable to patients. We have relationships with multiple agents who can arrange credit and payment options to fit just about any budget. Interested patients can apply for credit online. We offer discounts to patients who choose to target more than one area of the body during the same procedure, so many of our patients opt to take advantage of this potential savings. For example, patients who are getting back liposuction surgery may also choose to target their abdomen or flanks during the same procedure for a much more dramatic end result. By targeting multiple body areas, patients see a significant savings and they also experience less downtime than if they were to have two completely separate surgeries. As a minimally invasive procedure that is performed using only local anesthetic and sedation, Waterlipo™ is extremely safe. Thousands of patients undergo Waterlipo™ procedures every year without incident. But while the staff at the Chicago Liposuction by Lift Body Center goes the extra mile to make sure that procedures are performed safely, there are still risks involved with any kind of surgery. It’s important for patients to understand the potential risks involved with back liposuction. To learn more about Waterlipo™ Safety, please visit our Liposuction Safety page for additional information.